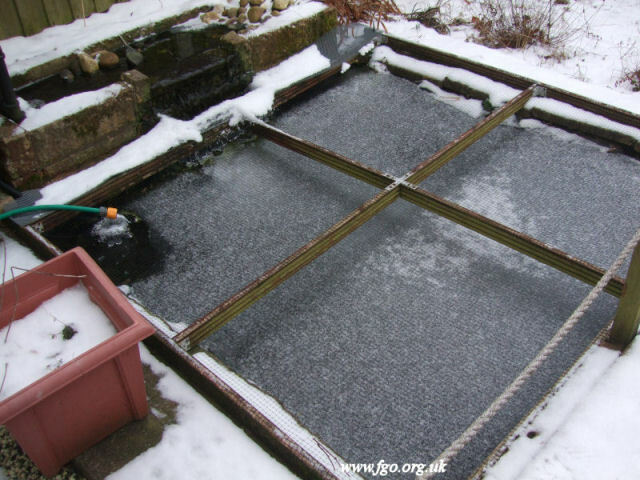 You must not let your pond freeze over for very long, otherwise dangerous gasses could build up to the detriment of your fish. 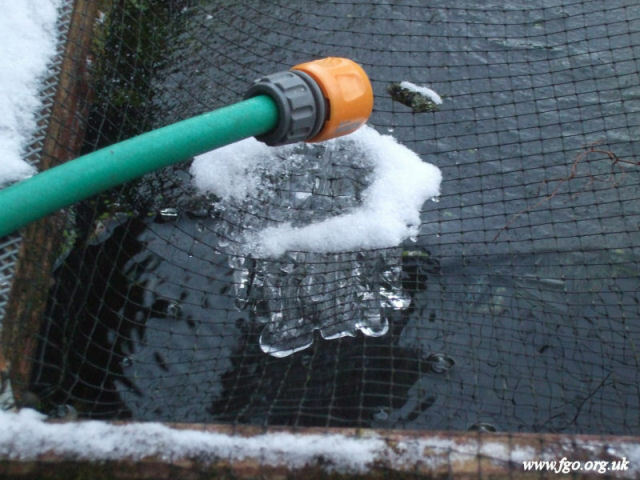 DO NOT break the ice by hammering on it, the shock could stress and even kill your fish, instead just pour cold or slightly warm water over it. Hot water could kill any fish that just happen to be nearby. 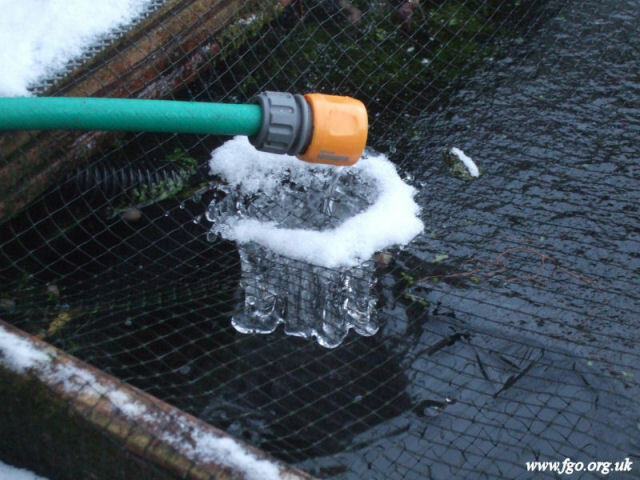 I always leave my pump and filter running everyday, all day even throughout winter, running water takes a lot to freeze so my pond never freezes over completely. Bear in mind also that fish will not eat if the temperature is below 40°F, about 5°C, in the cold winter months feed with a suitable winter food for example wheatgerm. Below are 4 photographs and a short video clip taken this morning 28/02/2018, following a night of below freezing temperature. 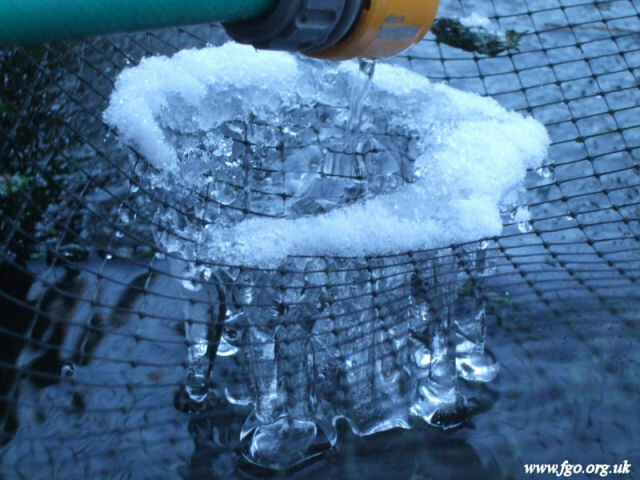 The inside of the ice is hollow as the slow trickling water from the hose drops to the pond. 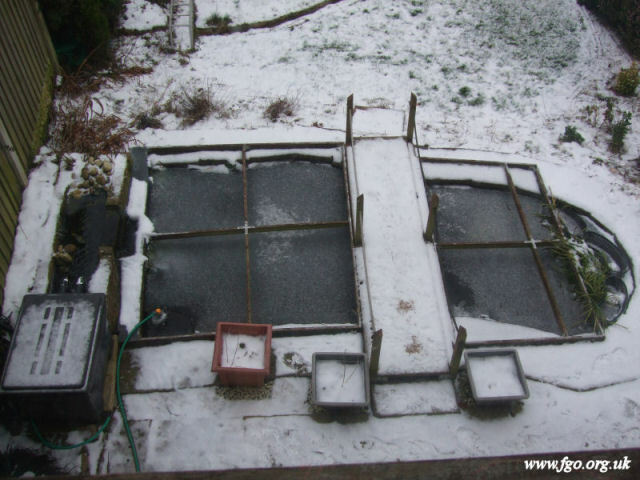 Showing a part of my frozen pond. Poor Heron, it must be starving! There had been a very heavy snowfall and I had put additional supports under the nets to take the weight of the snow and ice on them. The basic pond is now finished but a bridge is needed. We started with a temporary crossing until we had a proper bridge. The garden has never been planned in its entirety, it has just developed into what it is by adding to and changing what was already there and this will continue.